The Islamic Revolutionary Guard Corps (IRGC), the Praetorian Guard of Iran’s regime, controls most of the economy, as well as the black-market, alternative economy. The IRGC therefore actually benefits from sanctions; it is private firms, such as those involved in international commerce, that suffer. Why would IRGC operatives want to see the playing field made more level by private investment, transparency and a competitive economy? Sanctions never hurt the regime’s ruling class; lifting them only helped the regime solidify its power over its people. The objective of these two demands [an immediate lifting of all sanctions and no, or severely limited, inspections] is either to have them accepted, or to render it untenable for the Obama administration to offer Congress any deal that could be accepted – thereby shifting blame for the collapse of the talks to the U.S. The U.S should also be on guard against the mullahs‘ belief that the Obama administration is weak both politically and its aversion to using force. The mullahs might find great pleasure in humiliating Obama, as they did President Jimmy Carter, by dragging out hostage crisis negotiations by running out the clock until his term was over. They clearly believe that the Obama administration, simply to say it got „a deal,“ is ready to sign anything. From Washington to Riyadh, not to mention Jerusalem, statesmen are gritting their teeth at the possibility of a U.S.-Iran nuclear deal that seems overly generous to the theocratic-terror state of the Islamic Republic. Most intelligence analysts and journalists assume that because Iran’s leadership endorsed the negotiations and has been the beneficiary of several key concessions by the P5+1 (the five permanent members of the UN Security Council, plus Germany), that an agreement is imminent. Forecasters have been predicting what the likely consequences of such a deal would be: negative. But what if the Iranians walk? Sanctions never hurt the regime’s ruling class; lifting them only helped the regime to solidify its power over its people. A nuclear deal combined with an improvement in the commercial and business relations with the West would be inimical to IRGC interests. The Islamic Revolutionary Guard Corps (IRGC), the Praetorian Guard of the regime, controls most of the economy as well as the black-market, alternative economy. IRGC-controlled conglomerates operate outside the law and reap huge profits through their control of the black market. The IRGC therefore actually benefits by sanctions; it is the private firms, such as those involved in international commerce, that suffer. Furthermore, IRCG naval vessels, and private ships under their control, have been engaging in sanctions-breaking deliveries of imports across Persian Gulf waters to Dubai. The IRGC then sells the products at a profit by filtering them through the many foundations they control in Iran. The most recent example of IRGC’s skirting of sanctions involved the illegal acquisition of aircraft through front-organizations with offices in both Europe and the Arabian Peninsula. Mahan Air, an IRGC front, was able to purchase 15 used commercial aircraft for $300 million. Another front, al-Naser Air, was about to purchase two more aircraft, this time from a U.S. owner. Israeli intelligence, however, passed details of the planned sale to the U.S. government, and on May 21, the deal was scuttled by the Office of Export Enforcement of the Department of Commerce. Why would IRGC operatives want to see the playing field made more level by private investment, transparency and a competitive economy? Improved relations with Washington might raise false hopes among Iran’s citizens that the regime may ultimately improve its woeful record on human rights. There remains only a thin patina of clerical control over Iranian society; if the hoped-for social and political reforms were not implemented, the result could produce a destabilizing political environment, harmful to the interests of the regime. Another fallacy embraced by many „inside-the-beltway“ analysts is that, as the Supreme Leader Ayatollah Khamenei endorsed the negotiations, a legitimate deal is now probable. The once all-powerful Office of the Supreme Leader no longer calls all the shots. The current Iranian regime resembles a military junta or a security state as much as a theocracy. While the reach of Ayatollah Khamenei, through his network of representatives, still penetrates all dimensions of Iranian society, he does not have the final decision on key security matters. The regime’s strategic assets, for instance, such as its ballistic missile programs, are firmly under the control of the IRGC. Decisions related to Iran’s expansionist presence in the region are made by IRGC Quds Force Commander Qasem Soleimani. The role of Khamenei’s representative to the IRGC resembles more that of a handler than of an action officer. The principal task for the regime is to find a way to back out of the negotiations while avoiding the blame. Iran’s efforts at disengagement may already have been underway for the past few weeks; the pace of decoupling from the talks seems to be accelerating. Iran has been increasing its demands apparently in the hope that they will either be accepted, or else rejected like the „poison pills“ they are — such as inspectors no longer being allowed on its military sites. Another way to make the talks no longer palatable for the Obama administration was to create a hostile incident with the United States in the Persian Gulf, as it has tried to do by aggressively tailing American warships. Iranian ships affiliated with the IRGC Navy also seized a commercial ship, the Maersk Tigris, in the Strait of Hormuz, and temporarily detained both vessel and crew. Then, on May 14, IRGC boats fired several shots across the bow of a Singapore flagged vessel, but it escaped unharmed. By this type of reckless comportment, the IRGC Navy appears intent on producing a clash with American naval vessels in the Gulf waters. Western negotiators have only to recall the presidency of Mohammad Khatami, when the IRGC and Iran’s Ministry of Intelligence and Security operated independently after they felt that the reformers had gone too far, thus threatening hard-liner control of the regime. The IRGC may have decided that Rouhani along with his American-educated Foreign Minister Zarif have reached a similar tipping point. This independent IRGC initiative is being executed even though a deal would release Iranian monetary assets that would in turn boost the sagging economy. Iran’s combative posture in Gulf waters against international shipping is also a direct challenge to international maritime law, which guarantees freedom of navigation through the world’s shipping lanes such as the Strait of Hormuz. A key principle of U.S. foreign policy is to enforce this freedom of navigation, if it is challenged by any foreign power, as one also hopes the U.S. will do in the South China Sea. Mojtaba Zolnour, Ayatollah Khamenei’s Deputy Representative to the IRGC, stated that the Islamic Republic of Iran, „has the divine permission to destroy Israel.“ This media assault on Israel was designed to widen the divergence between the Obama administration and the Israeli government regarding the efficacy of the framework of a nuclear agreement negotiated so far. Additionally, various Iranian principals have drawn „lines in the sand“ designed to cause the Americans to disengage from the talks, such as the assertion that Iran will never accept inspection of its declared military sites. 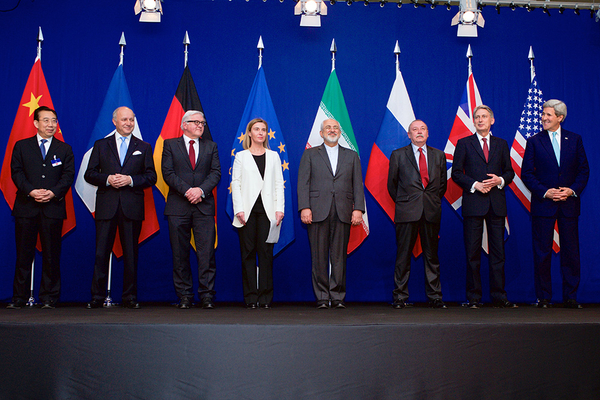 Another is Tehran’s repeated statement that it will not accept a gradual lifting of sanctions. Iranian leaders have insisted on immediate and irreversible lifting of all sanctions immediately after a nuclear deal is signed. The objective of these two demands is either to have them accepted, or to render it untenable for the Obama administration to offer Congress any deal that could be accepted — thereby shifting the blame for the collapse of the talks to the U.S. Regime hard-line representatives to the majlis [Iranian Parliament] have already been mobilizing members to denounce the talks as detrimental to Iran’s national sovereignty. Eightymajlis members signed a petition on May 12, calling upon the regime to suspend the nuclear talks until Washington halts its rhetorical threats against Iran. Hardliners in the majlis and elsewhere within the regime’s bureaucracy will likely continue to lobby against any deal. Western analysts should be looking for the Iranian regime’s hard-line media outlets to increase domestic commentary condemning alleged U.S. deception in the negotiations as a reason to abandon the talks. The death knell for the nuclear negotiations could come from newspapers such as Kayhan, a pro-regime newspaper run by Hossein Shariatmadari, and often characterized as a Khamenei mouthpiece. The regime’s Friday-prayer Imams in key Iranian cities might also start opposing the talks. The themes of their noonday khutbahs [sermons] are likely to appeal to Iranian people’s patriotism, and suggest that it is more important for Iran to endure continued sanctions rather than submit to intrusive monitoring that offends Iran’s sovereignty. Finally, hardliners who oppose any possibility of Iran’s improved relations with the U.S. may launch personal attacks on Iran’s negotiators to the nuclear talks, and, in an effort to discredit them, challenge their loyalty to the Iranian revolution. Their point of attack on Foreign Minister Mohammad Javad Zarif’s loyalty might be his alleged obsequious behavior to Secretary of State John Kerry. Zarif, on account of his many years of residency and education in the United States, can be depicted as an Americanized Iranian. The United States should also be on guard against the mullahs‘ belief that the Obama administration is weak — both politically and in its reluctance to use force. The mullahs might find great pleasure in humiliating Obama as they did President Jimmy Carter, when they dragged out hostage crisis negotiations by running out the clock until his term was over. They clearly believe that the Obama administration, simply to say it got „a deal,“ is ready to signanything. „Iran’s powerful Guard rejects inspection of military sites“ by Ali Akhbar Dareini, Associated Press, 19 April 2015. Deputy Chief of the IRGC General Hossein Salami is quoted and several more statements by IRGC officials since have repeated the same prohibitive statements regarding Iran’s military sites. „U.S. to Award Iran $11.9 Billion Through End of Nuke Talks,“ Washington Free Beacon, 21 January 2015. In the first of many subsequent denunciations, Senator Mark Clark of Illinois attacked the Obama administration’s plan to free Iran’s frozen assets if nuclear deal is reached.